Ask most people about the origin of anti-Muslim sentiment in the U.S. and they’ll inevitably refer to the terrorist attacks of 9/11. Anti-Muslim sentiment is therefore cast as the unfortunate (but understandable) result of Muslims behaving badly. But what if I told you anti-Muslim sentiment is almost entirely independent of the events of international conflicts, or even terrorist acts on U.S. soil, and much more tightly linked to election cycles and building domestic consent? As horrific as the attacks of September 11th 2001 were, the rise and fall (mostly rise) of negative sentiment toward Muslims and Islam in America does not coincide with this or any other Al-Qaeda act of violence. Instead, levels of anti-Muslim sentiment follow trends in domestic U.S. politics, not international terrorism. Before I go any further, let me say one thing up front: The American people are among the most accepting in the world. What anti-Muslim prejudice exists is by far outweighed by people with a sincere desire to understand and include. Leaders shape how people interpret events. Take for example American public perceptions of Muslim Americans. 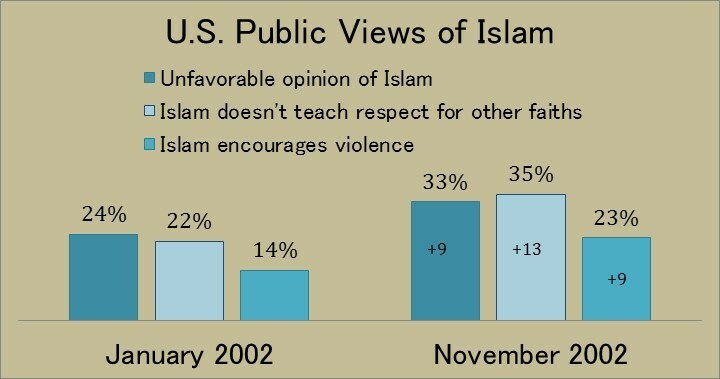 In March of 2001, eight months before the attacks of September 11th, 45% of Americans had favorable opinions of Muslim Americans and 24% had unfavorable opinions. Two months after the attacks, American opinion of US Muslims actually improved, rising fourteen points to 59% favorable and 17% unfavorable. What could explain this rise in positive attitudes toward Muslim Americans after terrorists many Americans perceived to be acting in the name of Islam killed almost 3000 Americans? The answer is George W. Bush. The president set the tone for the country. In those first few weeks after 9/11 when emotions were raw, when we could have had a disastrous period of anti-Muslim hatemongering, the leader of the nation called for tolerance. And so between March and November of 2001, after the worst terrorist attack on US soil at the hands of Al Qaeda, Americans felt more positive about their fellow citizens of the Islamic faith because the leader of the nation rightly helped distinguish between Islam and terrorism. But the tone of the public discourse quickly changed. If leaders matter more than events in shaping public opinion, then shouldn’t the election of a President with a Muslim sounding name, with Muslims in his family and whose language is strikingly more inclusive of Muslim Americans tip public opinion toward acceptance? Well, it’s complicated. President Obama did preside over a period of improving public opinion of Islam among Democrats from 2009 to 2013. Following an initial spike in negative perceptions of Islam as encouraging violence among Democrats and Republicans during the run up to the Iraq war, Democrats’ negative views began to decrease slowly. 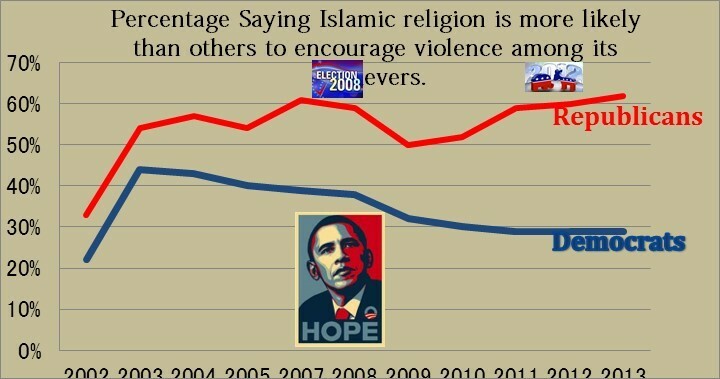 Then the view that Islam encouraged violence more than other religions decreased sharply among Democrats between 2008 and 2009 from roughly 40% to 30% and has remained at this level since. 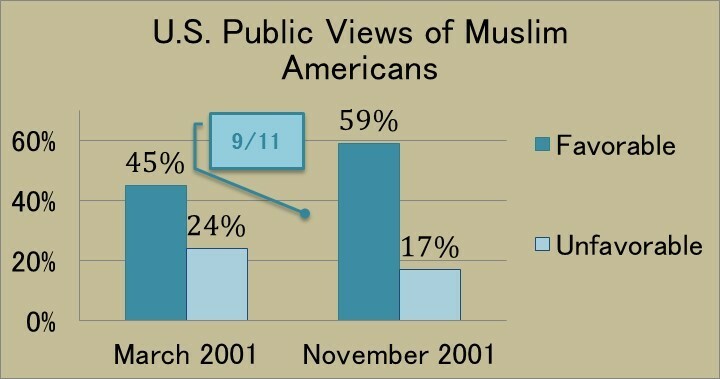 However, this same time period saw an alarming surge in anti-Islam sentiment among Republicans. By May of 2013 Republicans were roughly twice as likely (62%) as Democrats (30%) to say Islam is more likely than other religions to encourage violence among its believers. Republicans on the other hand saw a steady growth in the prevalence of this view between 2008 and 2013. Most striking however is that punctuating this period were two spikes in negative sentiment, coinciding perfectly with the 2008 and the 2012 presidential election. During both time frames anti-Muslim rhetorical was a staple tool among many Republican political figures, whether in the primaries or against Obama. Remarkably, public opinion on the link between Islam and violence did not change after the Boston Bombing among Republicans or Democrats, but rose ten percentage points among Republicans during election cycles. Though it often appears that anti-Muslim sentiment is a permanent part of today’s political discourse, things may be changing. For the first time Americans are more likely to believe Muslims face “a lot of discrimination” than homosexuals, Hispanics, Blacks or women. 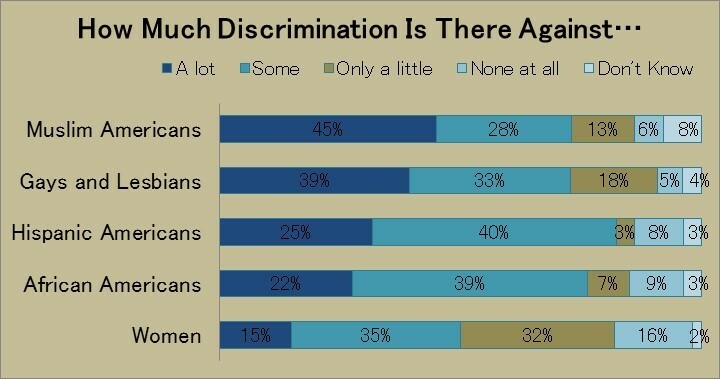 Where just five years ago it was difficult to even discuss “Islamophobia” because many simply denied it existed, today the majority of Americans believe anti-Muslim discrimination is real. The first step for social change in America is awareness of the problem. The data suggests that great progress has been made in this regard. The majority of young people (age 18-29) and Democrats say Islam does not encourage violence more than other religions and most in both groups recognize anti-Muslim discrimination as a problem. Those working for a more inclusive America would do well to build on these hopeful signs. Prejudice seeks to make the victim feel isolated and defeated. Muslim Americans must recognize that the fight against anti-Muslim sentiment is not theirs alone. Most Americans recognize the problem and disagree with the premise of a link between Islam and violence. 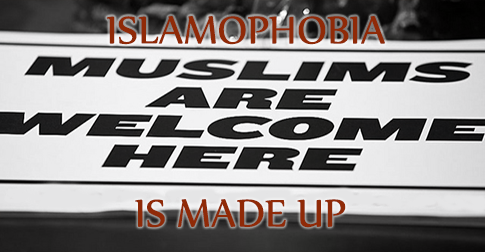 Most importantly, Islamophobia is the result of deliberate public manipulation, not organic cultural difference or a response to discrete acts of violence. As such, those who perpetuate anti-Muslim prejudice undermine our democracy by manipulating and misinforming the American people. Muslim Americans are vital organs in the body of the nation and the disease of racism turns the body against its self, making it mistake vital organs for foreign agents. This disease doesn’t only hurt those organs, but it eventually kills the entire body if not abated. 1 Survey taken before the DC sniper shootings. Dalia Mogahed is Chairman and CEO of Mogahed Consulting and former Executive Director of the Gallup Center for Muslim Studies.